Buyers love walking into a home for sale and seeing (and maybe smelling) a fresh coat of paint. It makes sense that the seller would want to show the property at its best. But what if the seller was painting so that they could cover something up? It may surprise you to find out a seller does not have to disclose past repairs, unless they are questions specifically asked on the residential real estate seller's disclosure. Whether you’re a buyer or a seller, here's what you need to know about real estate disclosures. Disclosure statements are the buyer’s opportunity to learn as much as they can about the physical condition of the property and the seller’s knowledge of the home. Seller's disclosures in Indianapolis range from knowledge of whether the appliances are defective to water/sewer systems to known hazardous conditions, such as mold, asbestos and radon gas. Not only do disclosure documents serve to inform buyers, they can protect the sellers from future legal action. It is the seller’s chance to lay out any issues or problems they are aware of. How does a seller go about making a disclosure to the buyer? Disclosure laws vary from state to state, even down to the city and county level. It typically comes in the form of boilerplate documents (put together by the local or state Realtor association), where the seller is responsible for answering a series of questions detailing their knowledge of key factors about the home and their experience there. You can find a copy of the Indiana Seller's Disclosure here. What do sellers typically disclose to potential buyers? The work and upgrades sellers have done to their property is not a required disclosure, but whether any work was completed without required permits, is. If done with permits, buyers are advised to cross check the seller’s disclosure with the city building permit report. Doing work without the city signing off with a permit is a key disclosure. If the work was not approved by the city, it may not have been performed to code and may cause a fire or health hazard. Buyers should independently investigate any non-permit work that was done. Other common disclosures include the existence of rodent or termite problems or damage, neighborhood associations and restrictions, any history of property line disputes, and defects or malfunctions with major systems or appliances. Disclosure documents also ask sellers if the property is involved in litigation or if there any liens on the property, etc. 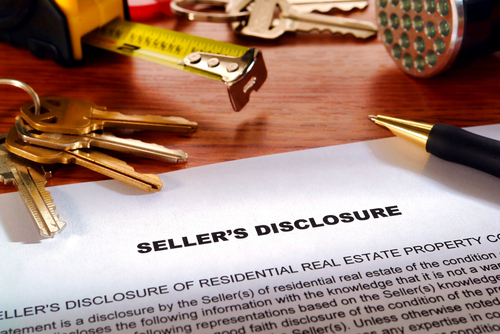 When does the buyer typically receive a seller’s disclosure statements? In Indiana, sellers provide these disclosures to the buyer before they write an offer. This allows the buyer to review and question any issues disclosed. It is also smart because it saves everyone time, hassle and expense by preventing transactions from falling apart after the fact. Buyers are required to sign off on disclosure documents and reports, so it’s important to review them carefully and ask questions if necessary. At Home to Indy, we feel that full disclosure is the way to go. It shows that the seller is thorough and upfront, which goes a long way toward giving buyers peace of mind.